In the first two Premier League gameweeks of the new season, we have seen countless goals scored from corners and set pieces as a result of poor organization and willingness to attack the ball. Of course, it is easy for Alan Shearer and Ian Wright to sit on Match of the Day and blame it on a zonal marking system, however when played correctly this approach can be far superior to the traditional English method of man marking, as it restricts the opposition’s ability to get a run on a static defender. Whichever method is employed, organized and intelligent set piece taking is arguably the easiest way to gain points in a hypercompetitive division like the Premier League. Last campaign, Chelsea and West Brom scored the most and conceded the least goals from corners in the English top flight, and subsequently experienced expectation-eclipsing seasons. With Arsenal and Liverpool already conceding multiple goals due to confusion from corners, I don’t see why they don’t get someone like Sam Allardyce in once a week to coach set pieces and give them a slight, yet decisive, edge in the race for the League title and a top four finish. When the defensive wall was first used by Northern Ireland in 1957, it was an innovative idea thought up to confuse and gain a slight advantage on a far superior Italy side. Now, former Goalkeeper and current football writer David Preece has outlined (in a recent article for The Times) why he believes walls used against free kicks more than 25 yards out are redundant and benefit the taker. The former Aberdeen shotstopper argues that the keeper adopting a more central position would not only give him a better sight of the ball, but also of the set piece taker, who’s body language can say a lot about where he wants to put the free kick. In the article, England Under-21 goalkeeping coach Tim Dittmer had ideas about moving the walls while the taker was lining up and therefore confusing and constantly altering the opponents thought process. It is certainly refreshing to see people with goalkeeping experience questioning the norm, especially compared with ex-strikers saying ‘he should’ve saved that’ without explanation on MOTD. Could Spurs’ Signing of Sanchez Prompt Alderweireld to Move into Defensive Midfield? After a long wait, Spurs finally made a signing this summer as they brought in highly rated young centre back Davidson Sanchez from Ajax. Sanchez was brilliant for the Dutch side last season, showing his ability to play the ball in Peter Bosz’s possession based 433. Mauricio Pochettino’s side currently play a system that seamlessly fluctuates between a 4231 and a 3421 with the defensive midfielder, usually Eric Dier, often moving into central defence. Sanchez isn’t going to beat Toby Aldeweireld or Jan Vertonghen to a starting place any time soon, however I love the idea of either him or Aldeweireld moving into a defensive midfield/central defence role. Both players, especially Aldeweireld, are exceptional long passers, very intelligent and defensively solid and could suit the role perfectly. Probably not going to happen! But it would be very interesting to see. Thanks Oliver once again for your guest article, I look forward to your next offering. 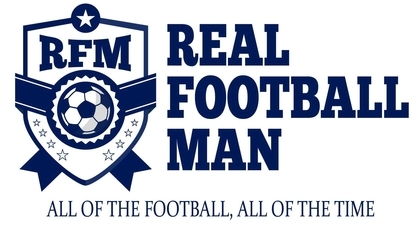 if you would like to get involved then feel free to send your work over to realfootballmanwordpress@gmail.com and I’ll make sure it has a home here at Real Football Man HQ.